Ciao a tutti! Having a good event? 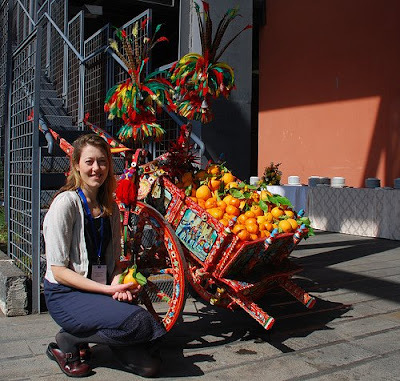 Probably everyone seen the ornately painted, blood orange and mandarin-bearing cart by the coffee break area. If you, like me, are a big fan of folk art (and fruit!) you might be interested to know about this traditional carrettu Sicilianu (Sicilain cart). Donkey or horse-drawn carts were introduced to the island by the Greeks, prior to bearing citrus fruit for members of the European grid community, they carried wine, food and people around the island.